Have watched two British films lately. 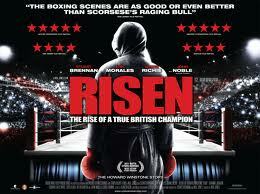 Also saw this documentary-like film about the Welsh boxer Howard Winstone. It's not exactly a documentary as it's just about the true-life tale of this featherweight boxer, but I guess the director is too eager to include all the landmark fights in Winstone's career that it becomes a bit tedious. Perhaps boxing fans would know which is which, but for the general audience having to watch so many similar fights again and again in detail can be quite tiresome. One doesn't really understand or see under what circumstances does Winstone win / lose a match; it all seems very random. What the film probably lacks is drama - of course, to stay true to the real-life story of Winstone is important, but as a film you need to make it engaging and cinematic. That's not what's present in this production of five years - and I wonder why it takes such a long time!